This book provides a systems-based approach to periodontology and offers a scientific roadmap of the interactions which can lead to periodontal disease. The content is divided into five sections. The first introduces the reader to the concept of systems theory and its mathematical foundation. 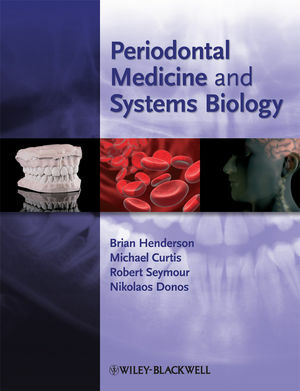 The second section provides the reader with a current view of periodontal medicine including the microbiology, molecular genetics, relationship to systemic disease and current and future therapies. Periodontitis is caused by members of the oral microbiota and the third section provides the reader with various views of the relationship of the microbiota to the host. The fourth section moves from the bacterium to the host and its immune responses to altered host: bacteria interactions. The final section deals specifically with bone destruction in periodontitis and brings the reader up-to-date with the current view of the control network that exists between mesenchymal cells such as osteoblasts, immune cells and osteoclast precursor cells that controls bone remodelling in health and disease. Brian Henderson is Professor of Cell Biology in the Division of Microbial Diseases at UCL Eastman Dental Institute, University College London. Michael A Curtis is Professor of Microbiology and Director of the Institute of Cell and Molecular Science at Barts and The London School of Medicine and Dentistry. Robert M Seymour is Professor in the UCL Department of Mathematics, University College London. Professor Nikos Donos is Director of Research Strategy and Head of Periodontology at UCL Eastman Dental Institute, University College London. PART I SYSTEMS THEORY AND COOPERATIVE BACTERIA. 1 Systems thinking in biology (Robert M. Seymour). 2 Metagenomics and its applications to human bacterial diseases (Julian R. Marchesi). PART II PERIODONTITIS: THE CLINICAL DISEASE. 3 Periodontitis: a modern clinical picture (Nikos Donos and Francesco D’Aiuto). 4 Plaque microbiology in (periodontal) health and disease (Anne D. Haffajee). 5 Population molecular genetics of periodontitis (Marja L. Laine, Ubele van der Velden and Bruno G. Loos). 6 Mechanisms linking periodontitis to systemic disease (Panos N. Papapanou and Jan H. Behle). 7 The impact of diabetes-enhanced inflammation on periodontal disease and bone destruction (Dana T. Graves). PART III PERIODONTITIS: COPINGWITH THE MICROBIOTA. 8 The microbiota of humans (Gerald W. Tannock). 9 The normal oral microbiota (William G. Wade). 10 Bacterial coaggregation and periodontitis (Paul E. Kolenbrander, Natalia I. Chalmers, Saravanan Periasamy, A.M. Ding and Shayla L. West-Barnette). 11 Dynamics of biofilm formation and relationship to periodontitis (Jonathan Pratten and Nicola Mordan). 12 Quorum sensing as a means of biofilm communication (Hanjuan Shao and Donald R. Demuth). 13 Genomics of Porphyromonas gingivalis (Keisuke Nakayama). 14 Genomics of Fusobacterium nucleatum (Vinayak Kapatral). 15 The Aggregatibacter (formerly Actinobacillus) actinomycetemcomitans genome – annotation, analysis and metabolic reconstruction (Fares Najar, Shaoping Lin, Lin Song, Hongshing Lai, James White, Steven Kenton and Bruce A. Roe). PART IV PERIODONTITIS: INNATE AND ACQUIRED IMMUNITY. 16 A new view of innate immunity for the twenty-first century (John Wright and Clare E. Bryant). 17 Innate immunity and homeostasis in the periodontium (Richard P. Darveau). 18 Antimicrobial host defence peptides in oral health and periodontitis (Deirdre A. Devine and Celine Cosseau). 19 Control of inflammation in periodontal disease (Hatice Hasturk, Alpdogan Kantarci and Thomas E. Van Dyke). 20 Antigen-presenting cells in chronic periodontitis (Ravi Jotwani and Christopher W. Cutler). 21 B-cell responses in periodontitis (Suzanne E. Barbour, John G. Tew and Harvey A. Schenkein). 22 T-cell responses in periodontitis (Gregory J. Seymour, Erica Gemmell and Kazuhisa Yamazaki). PART V PERIODONTITIS: BONE DESTRUCTION. 23 Current paradigms of osteoblast–osteoclast interactions and bacterial pathogen-induced bone resorption (Naoyuki Takahashi, Masanori Koide, Toshihide Noguchi and Tatsuo Suda). 24 Bacterial osteolytic mediators (Brian Henderson and Sean P. Nair). 25 Immune cell involvement in periodontal bone loss (Andy Y.-T. Teng). 26 How can periodontal bone loss be stopped? (Colin R. Dunstan).